Imperatrice was an entrepreneur of sorts, and one day devised an ingenious idea: to honor those women who demonstrated utmost chivalry by naming them to an elite and noble confederation. Dubbed the Castellane di Suavia—the “Ladies of the Castle”—these women would wear a damask sash across their body, fitted with the key of the castle, the symbol of power over the lands of Soave. It seems like a fairy tale, doesn’t it? But it’s 100% true. Imperatrice lived during the 14th century. She was the Princess of Antiochia, daughter of Corrado d’Antiochia, the count of Alba and Celano. 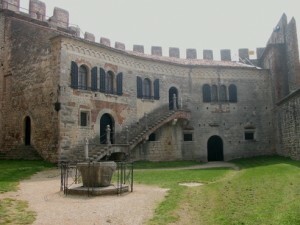 She married Federico II della Scala, count of Valpolicella, and their castle was in the ancient village of Soave, located near Verona about 100 km from Venice. Her women-only chivalric order, Castellane di Suavia, still exists today, and now honors women internationally who have distinguished themselves in the humanities: arts, science, politics, literature, sports, entertainment, and journalism. The Castellane also have male protectors called Spadarini, Knights of the Sword, who form a ceremonial militia established to defend them. The Spadarini are selected from only the most important men internationally, from scientists to wine producers and professors. 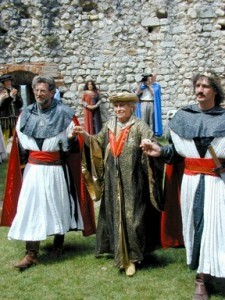 Today, on the second Sunday of May during the Medieval Feast of Soave, the investiture ceremony for the Castellane di Suavia is held in the open square within the ancient castle. 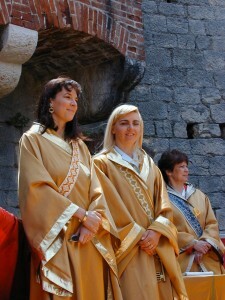 The event is attended by the most important people of Soave and Verona, and during the ritual, the Imperial Castellana di Suavia—the president of the order—hands over the revered damask sash and key to the new inductees. The honor lasts a lifetime, and comes with tremendous responsibility, because from that moment on, the Castellane become ambassadors of the virtues of the region’s celebrated white wine, Soave. Soave is also made into a dessert wine with a deep golden color, Recioto di Soave, in which the grapes are dried throughout the winter to concentrate their essence. 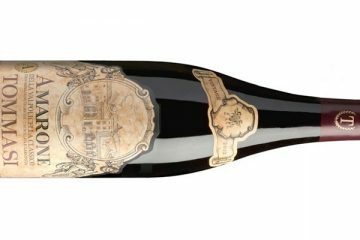 The wine evokes sweet aromas of honey, almonds, dried apricots, and white flowers—sensuous, balanced and ending in a long luxurious finish. 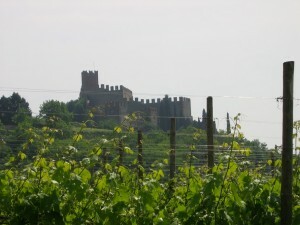 Soave’s virtues as a wine are well known, and have been for centuries. Imperatrice claimed that Soave was perfect both for overall health and even for her skin—she washed with it daily! But while washing in wine might sound outlandish, Soave may indeed be good for one’s overall health. A white wine like Soave contains two powerful antioxidants, tyrosol and hydroxytyrosol. At a recent international medical conference held in Soave, researchers announced their discovery that cellular mitochondria are more effectively protected by compounds in a white wine than by those in red. The study, directed by Dipak Das at the Cardiovascular Research Center at the University of Connecticut, found that the mitochondria of animals that consumed white wine had a higher resistance to a heart attack compared to those that had consumed red wine. Arthur Klatsky, a leading U.S. epidemiologist at the Kaiser Permanente Medical Care Program in Oakland, California, followed approximately130,000 patients over seven years and found that moderate alcohol consumers were better protected against heart disease than teetotalers, and that wine offered greater protection than other alcoholic beverages. But the surprise came when it was discovered that white wine was more protective against cardiovascular disease than red, and that women who were moderate consumers of white wine were among the most protected. I personally doubt that our Princess Imperatrice suspected her beloved Soave was a protector of women. She probably drank it simply because she liked it! In 1999 I published my book, “Soave e Verona; Vini e Castelli delle Terre Scaligere” (“Soave and Verona; Wines and Castles of the Land of Scaligere,” published by Slow Food Editions). At that time, the book caught the eye of Nenè Lovat, who was then Imperial Castellana di Soavia, the president of the order. 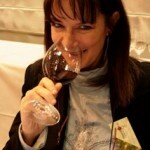 Since I was one of the few female wine journalists of Verona writing for traditional Italian press, she decided to nominate me Castellana di Suavia. I was inducted in May 2000. It was a sunny Sunday, and the streets were full of people in medieval dress: frolicking horses and regal knights, colorful flag bearers, and pensive archers preparing their aim. The Knights of the Sword of Suavia were also inducted that day, and I had the pleasure of accompanying the famous American wine consultant—and lovely person—Paul Wagner, founder and president of Balzac Communications, as he mounted the stage to become one of the Knights. When my turn came, men dressed as medieval soldiers kindly accompanied me onto the stage. It was so exciting! With rambunctious butterflies in my stomach, I heard my resume read before the wide and eager audience. Between trumpets and drum rolls, I wetted my face with Soave wine and drank from the traditional Soave cup. Finally, I was handed the damask sash and felt the heavy weight fall across my shoulder: the key to the city. Today in the movie “Letters to Juliet,” you can see Soave’s stunning scenery, with its undulating hills, dusty white roads, abundant vineyards, and—of course—ancient castles. The next time you open a bottle of Soave, think of this land and remember the beautiful and determined princess Imperatrice whose vision of virtue, service, and nobility has lasted over seven centuries. Wonderful story and article! I studied about Soave and other wines of Italy but this story never came up. It should be included in wine education because it makes wine theory much easier to remember when there’s a story behind it. Loved the article! Very entertaining and educational. @Melinda and Lisa: thank you very much for your comment, I’m happy you appreciate my post. It’s difficult that this story jumps out in Italy (and in Soave, or Verona! ), because few people know it. I’m a Castellana of Suavia, so for me it’s easier to talk about this.